The Editorial Board of IJBHT has proudly declared the best papers published in different issues in 2013. The readers, authors and researchers can read the best articles in IJBHT Website. As IJBHT follows double blind peer review policy strictly, every paper published in IJBHT is supposed to be quality research paper. However, the best paper selection team gives special emphasize on every aspect of a quality research paper and chooses 2 or 3 best papers published in each issue of the journal. IJBHT is inviting self-enthusiastic and experienced faculty and researchers worldwide to be the part of its editorial team. Since IJBHT follows double blind peer review policy, it welcomes those faculty and researchers as the editors who have tolerance and sufficient time to edit/review a research paper rigorously. Please note that it is a voluntary activity and no financial remuneration will be given to the editor. If you think that you are the right person that IJBHT is looking for, please download the ‘application form for editor’ and send the completed form to [email protected] along with your recent photograph and latest CV. 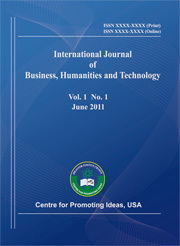 IJBHT is now indexed with DRJI, a newly established directory with the promise of indexing best journals. Visit www.drji.org .